KUALA LUMPUR: The Klang Valley will face an oversupply of office and retail space within the next two to three years, according to property consultancy CB Richard Ellis (M) Sdn Bhd. Capital values for residential units would see some increases in 2012, but at slower rates compared with the past 18 months. CB Richard Ellis executive chairman Christopher Boyd said while 2011 was a strong year in terms of demand for office space in the Klang Valley, rental values might succumb to an oversupply situation within the next 18 months. “Short-term demand for office space is stable but unlikely to grow sharply,” he said at a talk entitled Kuala Lumpur Property Market In Times Of Uncertainty, which was organised by MIDF Research here yesterday. Boyd said that total office space supply in the Klang Valley stood at 80.8 million sq ft at the end of the first half of 2011 (compared with 80 million sq ft at the end of 2010). However, it was estimated that an additional 25 million sq ft of office space would come onstream in the Klang Valley by 2015 (excluding mega projects such as the Naza group's KL Metropolis development, Warisan Merdeka tower and the Kuala Lumpur International Financial District). 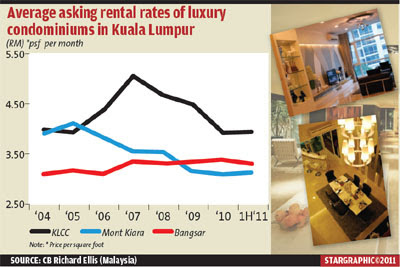 According to Boyd, vacancy rates in Kuala Lumpur are under 13%. “This is not an alarming number, but vacancy rates are expected to increase as more supply comes onstream.” A report by CB Richard Ellis also noted that prime gross asking rentals were flat at RM7 per sq ft with only a handful of buildings above this level. “Asking rents at most top buildings in the city centre are within the RM6 to RM10 per sq ft per month range, with only a few select buildings, such as Petronas Tower 2 and Maxis Tower, achieving monthly rents of RM10 per sq ft and above,” said the report. Meanwhile, CB Richard Ellis managing director Allan Soo said that the Klang Valley would overtake Singapore in terms of retail space per capita. Soo said as of the third quarter of 2011, total retail space supply in the Klang Valley was 43.7 million sq ft in 133 shopping centres and hypermarkets which was equivalent to 7.1 sq ft per capita (based on population of 6.1 million). Soo estimated that by 2014, the Klang Valley will have 53 million sq ft of retail space in 149 malls and hypermarkets. However, Soo pointed out that only about 43 shopping centres and hypermarkets out of the existing 133 (or 30%) were performing well. A report by CB Richard Ellis said the next rental review for established shopping centres would be in 2013 and rents may hit RM122 per sq ft. On residential property, Boyd said the pace of capital appreciation would slow in the next two years as new supply come onstream. In the condominium segment in Kuala Lumpur, total supply grew by 11% since end-2010 to 63,994 units in the first half of this year. The supply figures included all projects with average prices of RM350 per sq ft and above. While there had been a shift in buyers' preference towards smaller and more affordable units, Boyd said average asking rentals have declined in prime areas of Kuala Lumpur City Centre (KLCC) and Mont Kiara. “In some cases in the KLCC area and and Mont Kiara, condominium rentals have halved in the last two years.” Rental rates in the three main condo markets (KLCC, Bangsar and Mont Kiara) on a per sq ft basis have declined since 2007, reflecting weaker demand for rental units coupled with increased supply. Boyd also pointed out that new housing projects in the Klang Valley had begun to pick up in the first half of this year, with 15,030 units. This is contrasted with a trend of falling incoming supply, new completions and housing projects in the Klang Valley since 2004. From 2004 to 2007, there were new housing projects supplying more than 60,000 units each year. However, the supply from new housing projects dipped to 41,583 units in 2008 and subsequently, between 22,000 and 25,000 in the following two years. KUALA LUMPUR: Malaysia's office property market is likely to remain fairly stable next year, but oversupply is expected in the next 18 months, says CB Richard Ellis (CBRE) Malaysia Sdn Bhd, a property consultancy firm. The oversupply situation is due to a competitive rental market, its executive chairman Christopher Boyd told reporters after a luncheon talk on "Klang Valley Property Market Overview", hosted by MIDF Amanah Investment Bank Bhd here today. However, he said, the arrival of multinational corporations in Kuala Lumpur due to the low operating costs as well as the young and well-educated population would help stabilise the office market. Boyd said the supply situation has improved from two quarters ago, with some projects being pushed back or cancelled, but others are still on the drawing board. He added that major developments including Naza KL Metropolis, Tan Chong Segambut, Warisan Merdeka and KL International Financial District could have a major impact. JOHOR BARU: The property sector in Iskandar Malaysia will benefit immensely with the improvement in connectivity and accessibility within the economic growth corridor. Iskandar Regional Development Authority (Irda) chief executive officer Ismail Ibrahim said this could be seen from many new property projects being built in recent years. “Better accessibility and connectivity will help push up demand as well as prices for properties within Iskandar Malaysia,” he said at an event to mark the completion of three new traffic interchanges. These are the Bukit Indah-Taman Tema 1 and Taman Tema 2 interchanges costing RM135mil, Jalan Abu Bakar-Jalan Lingkaran Dalam interchange (RM17mil) and Indahpura elevated interchange (RM36.2mil). Ismail said the interchanges are expected to be open to motorists between now and the first quarter of 2012, pending approval from the Malaysian Highway Authority. He added that the new interchanges would help to reduce traffic congestion between 20% and 30% along existing roads and shorten travelling times between 15mins and 20mins. “Apart from upgrading the road network, we will also focus on improving the public transportation system in Iskandar Malaysia,” he said. Ismail said relevant parties in Malaysia and Singapore were already discussing the improvement of people’s movement between Iskandar Malaysia and Singapore via a Light Railway Transit system by 2018 or 2020. He said, to date, Irda had spent RM4bil from a RM6.38bil allocation to undertake infrastructure works such as road improvement, flood mitigation, river cleaning and public housing. The country’s first economic growth corridor Iskandar Malaysia, was launched on Nov 4, 2006, it covers 2,217 sq km located in the southernmost part of Johor. From 2006 up to the third quarter of this year, it has attracted RM77.82bil in committed investments, of which 60% is from domestic investors and 40% from foreigners. KUALA LUMPUR: Sunway Real Estate Investment Trust (Sunway REIT) recorded a 27.2 per cent jump in its net property income to RM70.3 million for the quarter ending Sept 30, 2011 over that of the previous corresponding period, said its manager Sunway REIT Management Sdn Bhd. The company attributed the strong performance to the higher contributions from the initial portfolio of eight assets and Sunway Putra Place of RM9.7 million and RM5.3 million respectively. Sunway REIT’s net realised income rose by 15.1 per cent to RM44.2 million in the same period from that of the previous corresponding period. Overall, Sunway REIT has performed better by RM5.8 million after taking into account the net loss of RM1.8 million by Sunway Putra Place due to no income contribution from Sunway Putra Hotel in the first quarter of its current financial year. Sunway REIT secured full control and possession of Sunway Putra Place including the hotel on Sept 28 2011, and the manager expects positive contribution for the financial year ending June 2012. The manager announced distribution per unit of 1.75 sen for the first quarter of its current financial year, representing an increase of 15.9 per cent compared to the previous corresponding period. This translates into an annualised distribution yield of 6.3 per cent based on Sunway REIT’s closing price of RM1.11 on Sept 30, 2011. Sunway REIT Management chief executive officer Datuk Jeffrey Ng said: “We are positive on the prospect of the portfolio for this financial year amidst headwinds in the external environment. With the full possession and control of Sunway Putra Place, the focus now is to turn around the property and reposition the property into a must-visit destination for local visitors and foreign tourists." "We are confident that upon the completion of the refurbishment exercise, the asset will enjoy a quantum leap in income as well as capital appreciation in the asset value," he added.